A variety of arena displays, charity stalls as well as food and drink stalls! On-line ticket sales close at midnight on the 30th of April. 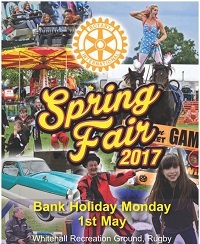 The fair will run from 12:00pm until 5.00pm come along, join in the fun and help to raise money for local charities. ** based on the purchase of 2 Adult and 2 Child tickets purchased as an e-ticket and including booking fees.